Monitoring and analyzing changes in Microsoft Active Directory is one of the major challenges faced by any IT Administrator. User Reports from ADManager Plus give complete insight of the Windows Active Directory domain, having multiple Organizational units and numerous users, to monitor and manage the user account proactively and facilitating easy handling of this otherwise tedious and time consuming activity and also simplifies the process of creating reports. Easy to generate / Schedule Reports / Automated Report generation. 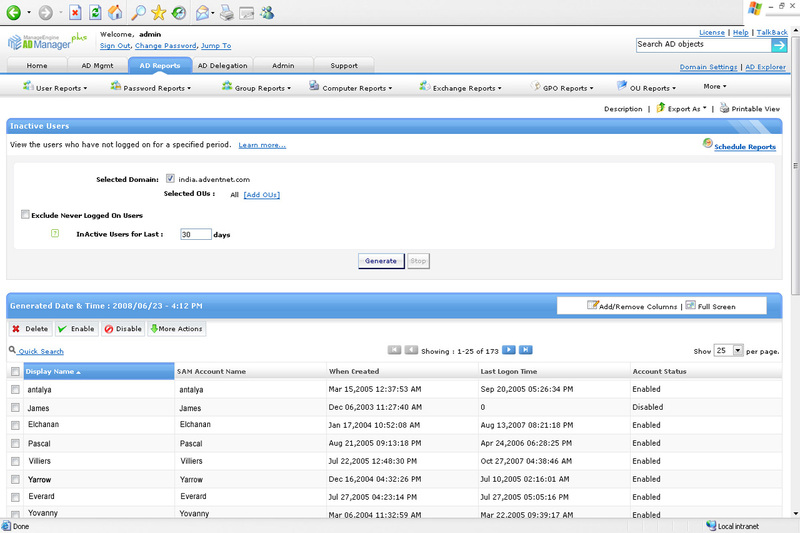 Restriction of report generation to specific OUs. 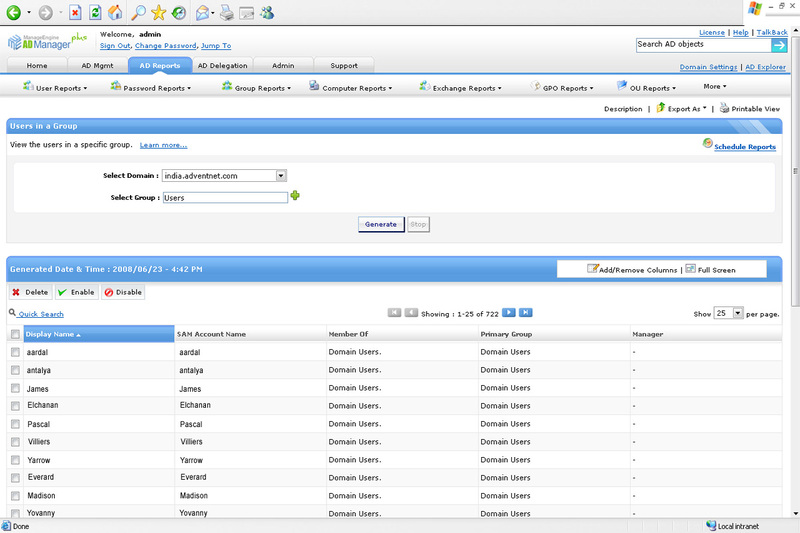 Exportable in various formats (CSV, Excel, PDF, HTML, CSVDE). Under General User Reports, the All Users report gives detailed information like creation, deletion of user accounts, group information, changes to the attributes, etc on all the users in the selected domain. 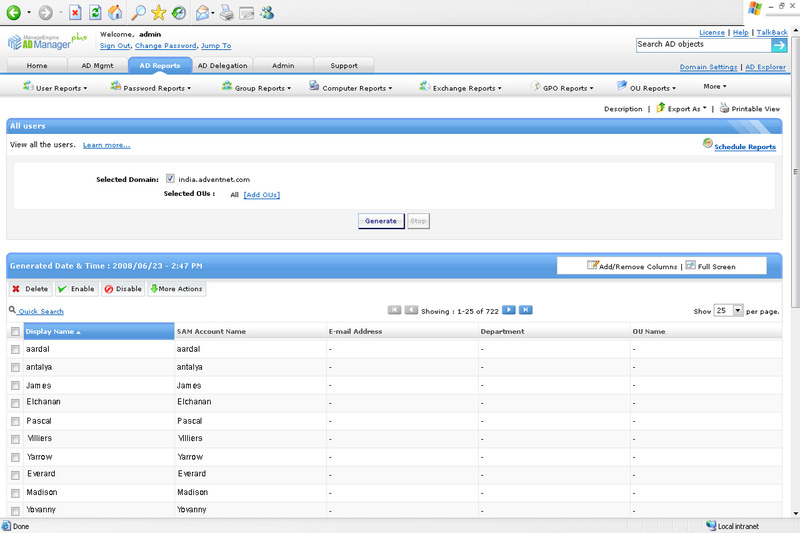 To find the users having blank attribute values, the Users with Empty Attributes report can be generated. The history of the users' Recent Updates can be checked from Recently Created Users Report, Recently Deleted Users Report and Recently Modified Users Report. 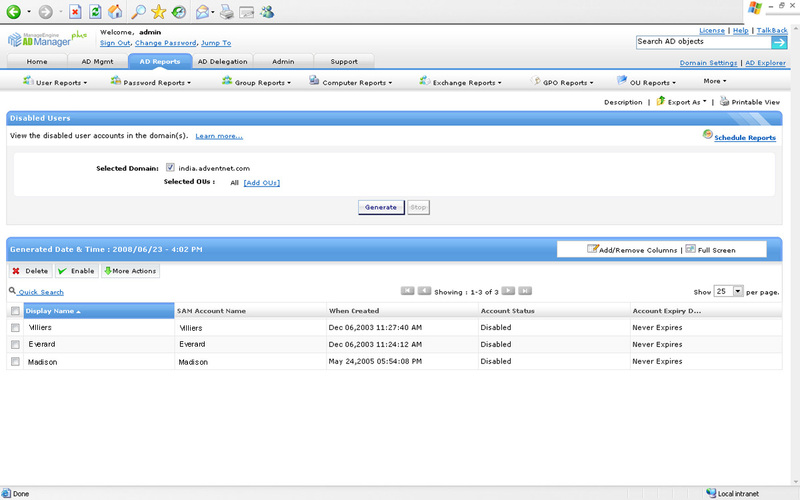 Specialized Reports to detect users with Logon Scripts and also the users without logon Script can be generated. The photos of the users, if available, will be displayed in the All Users report. For this photo attribute to be fetched while generating the report, it can be customized to appear by using the Add/Remove columns option in the reports section. Thus along with other user attributes, the user photo will be displayed. Likewise, User account status reports category hosts specialized reports that extract details of disabled users, locked out users and user account expiry information. Reports on Account Expired Users, recently account expired users, user accounts that are soon to get expired, and those users whose accounts will never be expired can be maintained from this active directory user report set, which will help in easy administration and management of user accounts. User Logon Reports maintain a history of User login Information. Reports on Inactive users (users who have not logged on for a certain period), Users who have logged on recently, users who have never logged on, enabled users, can be scheduled to be generated. The Logon Hour based report will give us a clear idea of the users who had logged on in a specified time frame. From the Nested Users Report, the group information of the user can be deciphered. Details relating to the Users in a particular group and also the details of the multiple groups the user belongs to can be understood from these reports. ADManager Plus can be an effective tool that can help you meet your Compliance Audit Requirements. A whole set of must have reports can be generated and can be used as a key resource for facing Compliance Audits. The list of active directory reports that are relevant to SOX Compliance are available in the SOX Compliance section.